There is good news for Pakistani Samsung fans that the Galaxy Note 5 has reached 5 and they can buy this new phone from all the retail outlets across Pakistan. Most interesting thing is that the device has been released in Pakistan even before its release in Europe. Till now, the Galaxy Note 5 is the best device of Samsung and has beaten even the previous most famous the Galaxy S6. Similar to the S6 flagship, this phablet has a 5.7” Super AMOLED screen covered with metal and glass body. 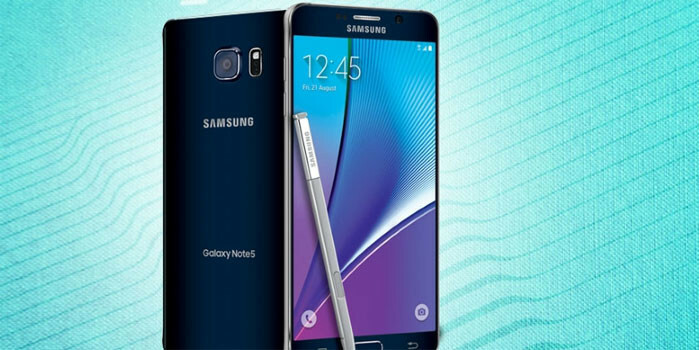 The basic features like S Pen have also improved in Note 5 which is now more precise with improved functionality. The internals of this new Samsung new flagship includes 2.1 GHz octa core Exynos 7420 processor along with 4GB of RAM. Like the S6, there is a 16 MP camera which is capable of shooting 4k videos. A 3,000 mAh non replaceable battery is there to power the device. There is a great note taking features in the phone through which the stylus can be improved further while its functionality has also been upgraded. By using the new and improved S Pen, the users can take notes even when the screen is off. Android 5.1.1 and TouchWiz UI are also there which shows that the software features of the phone have also improved. The device has reached Pakistan before several countries but its price is also higher than other markets. It’s quite expensive as it will cost Rs. 82, 000 but one thing is sure that you will get the best Samsung device in that price.